This entry was posted in Books and tagged Muriel Spark, Scottish author, The Driver's Seat by Katrina. Bookmark the permalink. I can’t decide if I like Muriel Spark or not. I’ve read a few of her books and they are funny, original and fascinating – but so bleak at times. I lean toward liking her, though, so I will read The Driver’s Seat at some point! Totally off-topic: a friend of mine has a son who just went on a mission for the LDS church. He is currently serving in Kirkcaldy! Her books are very hit and miss I think and as a person she was distinctly weird, it didn’t help that she took a lot of diet pills which were known to have hallucinations as a side effect. She only had one child and she treated him really badly I believe. Very interesting about your friend’s son. I’m now living about 7 miles from Kirkcaldy, the LDS church seem to send a lot of missionaries here, I passed a pair of them last week, they were standing outside a local supermarket. I always feel sorry for them – being such a long way from home. 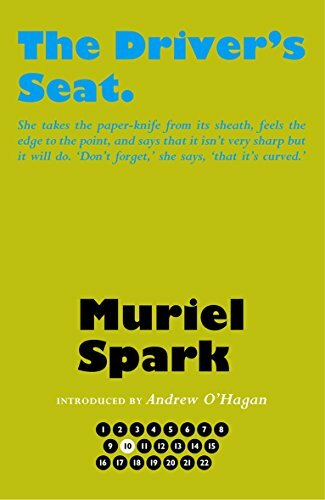 Oh, I liked this post and felt cheered by it–I like Muriel Spark (in small doses), as this one seems to be. And how I laughed!! We all need a laugh today. We certainly do need a laugh. I don’t know if it’s worse on our side of the pond or yours at the moment!